Whereas last year’s Symposium dealt with Devon’s physical landscape, this year’s Symposium focuses on the social landscape. 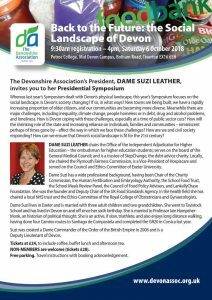 Is Devon’s society changing? If so, in what ways? New towns are being built, we have a rapidly increasing proportion of older citizens, and our communities are becoming more diverse. Meanwhile there are major challenges, including inequality, climate change, people homeless or in debt, drug and alcohol problems, and loneliness. How is Devon coping with these challenges, especially at a time of public sector cuts? How will the shrinking role of the state and increasing reliance on individuals, families and communities – reminiscent perhaps of times gone by – affect the way in which we face these challenges? How are we and civil society responding? How can we ensure that Devon’s social landscape is fit for the 21st century? Devon has a relatively stable, ethnically homogenous population, which is predicted to increase by 15% by 2033. A direct result of this will be a very large number of people over 60 years old, with a particularly striking increase in the number of over 85s. With one in three developing health problems, as well as challenges brought about by isolation and a loss of close social networks, one can no longer rely on the authorities alone to provide the necessary support; and this is especially acute in the face of increasing personal debt and public sector financial austerity and cuts. The answer must lie in developing an even stronger civil society, somewhat reminiscent of a bygone age but tailored to the social landscape of the 21st century. The morning session consisted of four talks, starting with ‘An historical perspective’ by Jonathan Barry (Professor of Early Modern History, Exeter University) and an overview of ‘Devon’s people today’ by Dr Virginia Pearson (Director of Public Health, Devon County Council). 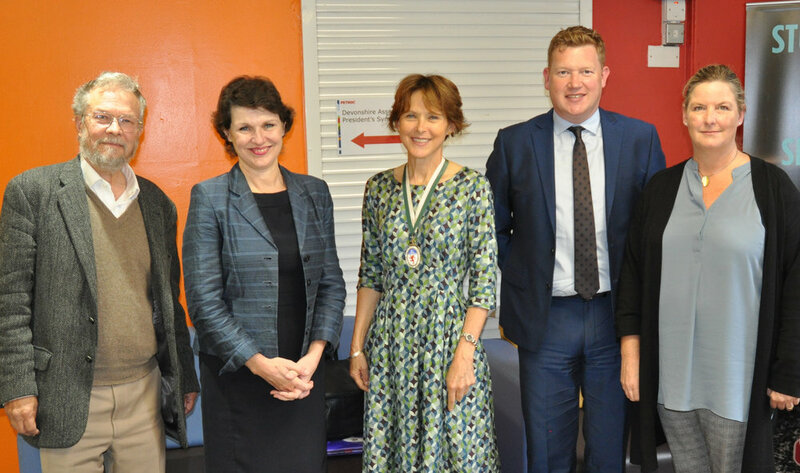 These were followed by ‘Re-imagining the state’ by Simon Kitchen (Head of Strategy, Policy and Organisational Change, Devon County Council) and ‘Re-imagining civil society’ by Martha Wilkinson (Chief Executive, Devon Community Foundation). 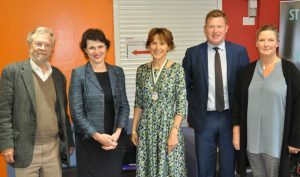 After lunch, Dame Suzi chaired a lively panel debate entitled ‘Fit for the 21st century, a panel discussion on civill society – the state of local action/philanthropy’. The panel members were: Elaine Cooke (Devon Communities Together); Roger Mitchell (Plymouth Octopus Project); Martha Wilkinson (Devon Community Foundation); and Geoff Pringle (Hospiscare). Both the morning and afternoon sessions were brought to a close by Christopher Southgate (Associate Professor of Theology, Exeter University) who recited some of his exquisite, spiritually powerful poetry. seem to haunt the valley-floors. like that new-etched scimitar of moon. * Reprinted with permission from Christopher Southgate, Beyond the Bitter Wind, Poems 1982-2000 (Shoestring Press). Everyone agreed that this was a noteworthy symposium in terms of its richness of content, thematic continuity, and presentation technique. Photos courtesy of Antony T Buller.